Thanks to Scott Sillars, Julia Eizenkop, and Dylan Regan for helping pull garlic mustard this past weekend before it goes to seed. The garlic mustard seedpods, visible in the foreground of the photo, are still green and are now safely bagged up. If this is done every year, the garlic mustard diminish in numbers each year until their reservoir of seeds in the soil is exhausted. The threat posed by invasive plant species has been greatly reduced over the past couple years, including the Wisteria, a pretty but much too aggressive vine that until recently had been smothering trees and the Veblen House grounds. FOHW has also worked with neighbors of the park to prevent the spread of lesser celandine into the preserve, and FOHW board members Kurt and Sally have continued to open up long-obscured vistas by cutting down invasive honeysuckles, privet, barberry, and especially the winged euonymus. 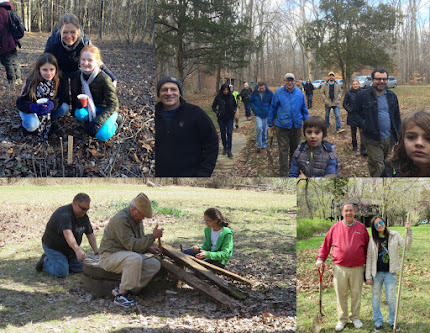 These volunteer efforts have been augmented by the town's hiring of a professional crew to remove Japanese aralia and other less common invasives in Herrontown Woods and in other Princeton preserves like Mountain Lakes. Invasive species are often considered an intractable problem, but we find that by being strategic and persistent, a great deal of progress can be made.